Full title: 'Eryn. Hiberniae Britannicae Insulae Nova Descriptio Irlandt'. 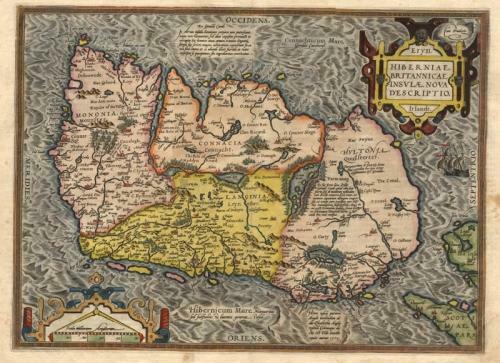 This is Abraham Ortelius' first map of Ireland from the Theatrum Orbis Terrarum atlas. This is a classic Ortelius map - visually appealing with many decorative elements and relatively accurate, having been based on Mercator's famous 1564 wall map of the British Isles. The condition is very good with only minor foxing in the margins and a small (1 cm) split at the bottom centrefold. The paper is strong and the original colours are bright. Reference: van den Broecke 22.